I searched around and looked at quite a few recipes but ultimately settled on the one that follows. I liked that it was simple, traditional with no new culinary twists, and had been tested by many. I also wanted to find a recipe that included non-processed cocoa. You see, true Red Velvet Cake, I learned, is made with cocoa. It is not merely yellow cake batter with red food coloring or beet juice added in for effect. In fact, it is the cocoa that takes on the red hue. Apparently, non-processed cocoa contains the red pigment anthocyanin (bet you didn’t know you would be getting a science lesson today!) and when you add an acid like buttermilk or vinegar (which is used to activate baking soda and leavens the cake), the cocoa becomes reddish-brown in color from the pigment. Of course, a little extra food dye doesn’t hurt either to enhance the color even more. While researching for a recipe I picked up a few more tidbits about this time-honored cake. Besides the fact that my 10-year-old daughter LOVES Red Velvet Cake (I have no idea where she acquired such a mature palate or how she even discovered it to begin with, but she actually requested it for her 7-year birthday party a few years ago), plenty of other people love it too. Apparently it is one of the the most requested cakes at weddings these days. And according to a New York Times article, there are more than 20 bakeries in New York City alone (and that’s not even counting the outer boroughs) that now sell Red Velvet Cake or cupcakes – take that New York cheese cake! A Red Velvet groom’s cake shaped like an armadillo appeared in the 1989 film “Steel Magnolias” and many bakers and food historians attribute its rise in popularity to that role. The singer and entertainer, Jessica Simpson served a Red Velvet Cake at her wedding to Nick Lachey in 2002. While her marriage didn’t last, the cake seems to have staying power! Most foodies agree that the cake originated in the South back in the early 1900s and that beets lent it its color before the advent of added food coloring, but no one really knows for sure. There is a well-known story about how the cake became popularized. 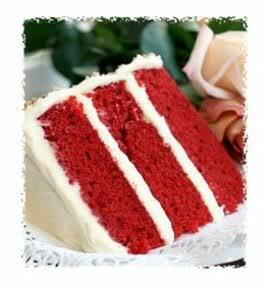 Urban legend has it that a woman was staying at the famous Waldorf-Astoria Hotel in NYC and was so taken with the Red Velvet Cake she ordered from their menu (it had become a signature dessert at the hotel back in the 1920s), that she wrote the hotel and asked for the chef’s name along with a copy of the recipe. The recipe arrived along with a bill for over $100.00. The woman was so furious, she copied the recipe and sent it to everyone she knew. For my attempt at baking Red Velvet Cake, I chose to use a different recipe than that indignant lady supposedly passed around and it turned out just as good. The end result was delicious! Below are the recipes I used. Happy Baking! 1. Preheat oven to 350 degrees. Place teaspoon of butter in each of 3 round 9-inch layer cake pans and place pans in oven for a few minutes until butter melts. Remove pans from oven, brush interior bottom and sides of each with butter and line bottoms with parchment. 2. Whisk cake flour, cocoa and salt in a bowl. 3. Place oil and sugar in bowl and beat with an electric mixer at medium speed until well-blended. Beat in eggs one at a time. With machine on low, very slowly add red food coloring. (Be careful; it may splash.) Add vanilla. Add flour mixture alternately with buttermilk in two batches. Scrape down bowl and beat just long enough to combine. 4. Place baking soda in a small dish, stir in vinegar and add to batter with mixer running. Beat for 10 seconds. 2. Blend cream cheese and mascarpone in food processor or with electric mixer until smooth. Add vanilla, pulse briefly, and add confectioners’ sugar. Blend well. Yield: Icing for top and sides of 3-layer cake.